Jordan A. Archuleta Bio: Due to his father operating Archuleta & Associates, Inc. for over 35 years, Jordan Archuleta has always been around the investigative field. There is not a time where he can’t remember thinking or simply acting like an investigator. At a young age he can remember shadowing his dad through many different investigative scenarios. Whether it is a memory of a fire scene or positioning a measurement cone at a traffic accident scene, he has had the great opportunity to study from one of the best in the field. Like many individuals of his generation he went to college and studied business administration. He thought of a career in pharmaceutical sales but remembers a conversation he had with his father shortly before graduating from CSU Fresno in the spring of 1999. His father had a belief that with his background primarily being in field investigations and his sons background/studies ingrained with a business bias. They could mesh together two separate conceptual ideals and create an organization within the investigation field that could impact from multiple angles. Since becoming a partner of Archuleta & Associates, Inc. he has made it his goal to streamline the investigative process and protocols his father has relied on for over a quarter century. When meeting with any prospective client he always stresses that no other investigator can match his fathers intensity and keen sense of any case to which they become involved. From another standpoint, it is his job to make sure that company never becomes involved in any type of similar business dilemma again. Mr. Archuleta is the father of two young children, Severiano and Stella. 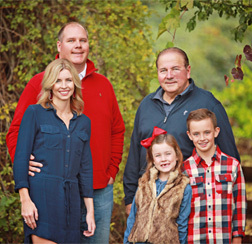 He and his wife Heather have made their home in Lodi, California and thoroughly enjoy family vacations, time spent with friends, and enjoying the local country club where Mr. Archuleta serves on the Board of Directors. Along with a deep passion for the game of golf and taking pride in his own personal game, he enjoys watching almost any athletic competition and never misses a chance to follow his beloved alma mater, Fresno State.